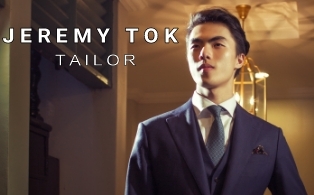 The first step is look at as many bespoke suits as possible to form an idea of your ideal suit. Research on your preferred fabric: Good quality wool is wrinkle-resistant and versatile. Wool-mohair mixes are cooler. A fully canvassed suit is extensively sewn by hand for more flexibility and durability. 1. Exquisite design: Putting together good quality material harmoniously. 2. Defined and unique silhouette to accentuate the curves. The bodice of a premium gown is meticulously made to flatter the waistline. 3. Finer workmanship and precision in the process of detailing. Indian bridal wear is all about good quality fabrics and fine craftsmanship. The bridal gowns are heavily adorned with antique gold, gotapatti, dabka, and zari combining fusion cuts and traditional embroidery. Many brides these days prefer lehengas as they’re easier to put on than sarees. The bridal collection is particularly unique and elegant made for modern brides who are looking for something different. I love how she innovates on the gown special features, improvised designs of peplums, lace and sheer. 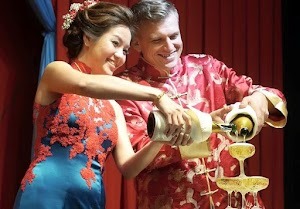 Cheongsam (長衫) also known qipao (旗袍) is a tight fitting, short sleeve, one-piece traditional Chinese dress with high collar. 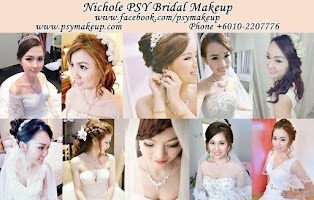 Here you can custom make one using lace fabric or details for your wedding tea ceremony or wedding reception. 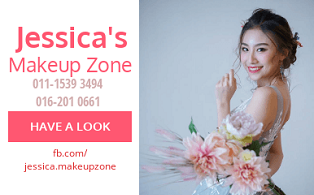 This boutique is the pioneer in Malaysia that offers international designer wedding and evening dresses from world's most sought-after names such as Annasul Y., Atelier Lyanna, Pnina Tornai, Lusan Mandongus, Monique Lhuilliers Bridesmaid, Pronovias, Rosa Clara, Zuhair Murad. 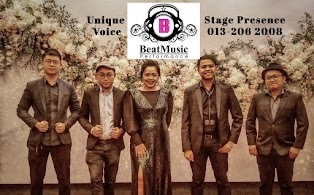 Tuxedo is worn to lend the wedding occasion an extra elegance. The lapels, made of glossy silk satin suggest special occasion wear as it is too fragile for daily use. Instead of the cummerbund which some may think is clumsy, a horseshoe vest wears more securely and is more elegant. 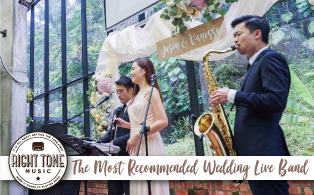 Before shopping for you perfect wedding gown, let's get familiarized with some of the more common fabric, material and design. 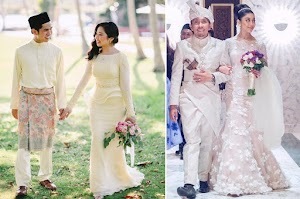 You have to try it on to feel the material, its overall look and effect on your body, it will be a lot easier to land on the most fitting dress. 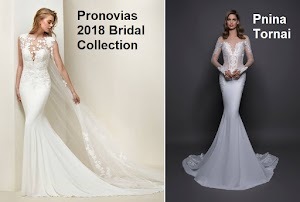 Alençon (Queen of Lace) is renowned for its heavenly detailing and heavy corded outlined patterns, giving it a 3D look, is the most popular for wedding gowns. Chantilly is a delicate lace with light and shadow effect in the pattern. 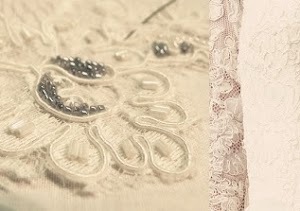 Venise lace consists of motifs held together by connecting stitches without background netting. Calculate your body shape [here]: Enter vital stats and get recommendations. The fitting gown [Silhouette] can disguise the unflattering part and enhance the figure harmoniously. Pick the [Neckline] that balances your shoulder/ neck broadness, accentuates or tones the bust and is appropriate for the venue. 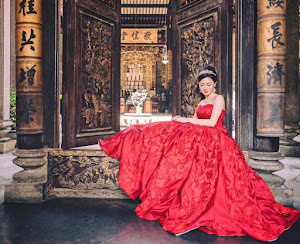 A list of wedding, evening traditional gown/ attire shops and boutiques for the brides and grooms-to-be. This is for you to have an overview of the available options before delving into the individual details. 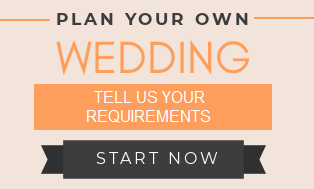 You can rent, buy off the rack, make-to-measure or get a bundle in the bridal package. How to choose the right combination of jacket, tie, shirt, waistcoat. 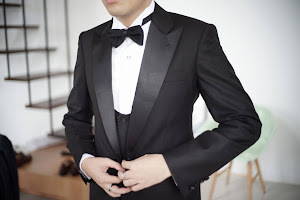 Check out the details of menswear: What is Tux vs. Suit, types of lapels, pockets, vents, tie or cravat. Formal 3-piece, Slim-fit or the flamboyant English style. 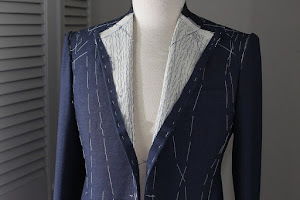 Also there are some general rules of how your suit should fit and the material to consider when tailoring. Feast your eyes on a variety of gorgeous, trendy dresses. It is easier to compare with all the pictures displayed in front of you and pick the one you fancy most. 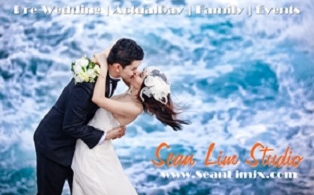 Learn about various gown, suit material, cut, style. Designer Bridal Room: Absolute pros. Made me feel comfortable during the whole gown selection and measurement taking process. They have private fitting rooms with a couch for family/friends. Will be going for my first fitting in a few months - can't wait to see the finished product!